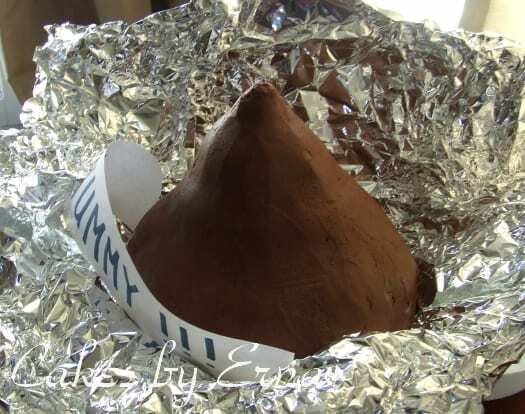 You are here: Home / Food / Cakes by Erna / A Hershey’s Kiss Cake! I loooove chocolate! If I were to choose my all time favorite dessert or snack, it would have to be chocolate. I know I’m not the only one, so this cake is for all the chocolate lovers out there. As much as I would like to eat every cake that I make, I do have to restrain myself and will often send them with my husband to work. At least there are scraps to eat and we don’t want to waste now do we? Come see more Cakes By Erna. Erna is a happily married stay-at-home mom to three beautiful children. She fell in love with cake decorating after taking some local cake decorating courses. She is a hobby baker and decorates cakes for her family and friends. Erna continues to do what she loves by working a few hours at a local bakery (P.S. Cake Designs). Oh awesome! Dark chocolate please! I would love a Hershey Kiss cake!